SINGAPORE - National service is important, especially as the security landscape becomes more complex, said President Halimah Yacob. Madam Halimah told the officer commissioning parade at the SAFTI Military Institute on Saturday (Dec 15): "We have only ourselves to depend upon in the defence of our home, which is why your service to the nation is important. "A strong and credible SAF has laid the foundations for Singapore to enjoy more than 50 years of peace and stability, as well as to thrive, progress and prosper. "The SAF provides us with the ballast to stand firm and respond to intimidation, and its strength lies in the generations of servicemen and women who have toiled over the years, to fight for their home and their loved ones." 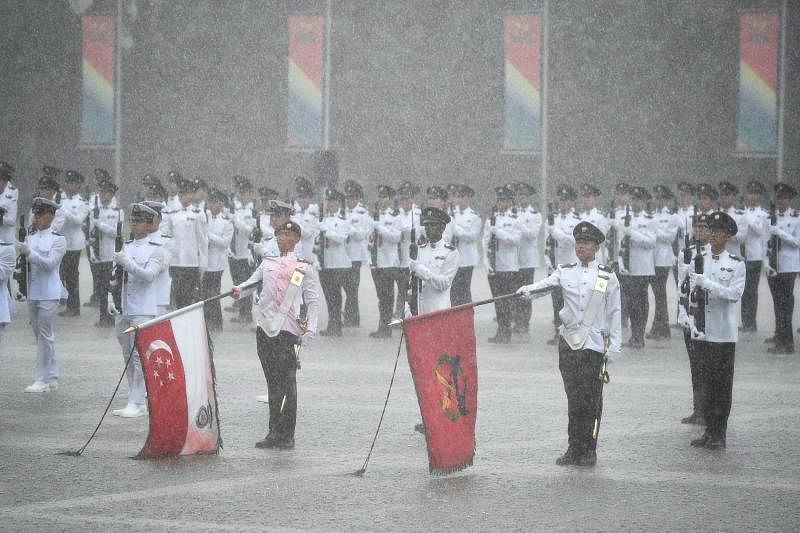 The parade marked the completion of 38 weeks of rigorous training at the Officer Cadet School and saw 384 cadets - 300 from the Army, 34 from the Navy and 50 from the Air Force - commissioned as officers of the Singapore Armed Forces (SAF). She noted that the security landscape has also become more complex, with new threats such as terrorism and cyber attacks: "Even as Singapore thrives with the support of a strong SAF, we must recognise that our security landscape is becoming increasingly complex, uncertain and volatile. "While the SAF has proven to be competent in guarding against conventional threats, rogue actors have sought to do harm through increasingly non-conventional means." To combat these new threats, the SAF has instigated Exercise Northstar and Exercise Highcrest, which put soldiers through realistic terror attack simulations to train them to respond in times of crisis. Last year, the SAF inaugurated the C4 Command to beef up cyber defence capabilities. The Cyber NSF scheme was also launched this year to employ the skills of full-time national servicemen (NSFs) with talent and expertise in this area to help defend against cyber attacks. "Attacks with the potential of nation-wide disruptions have been launched across state boundaries. The recent SingHealth cyber attack, for instance, resulted in an unprecedented scale of data breach, reminding us of the need to constantly strengthen our cyber defence capabilities," Madam Halimah added. 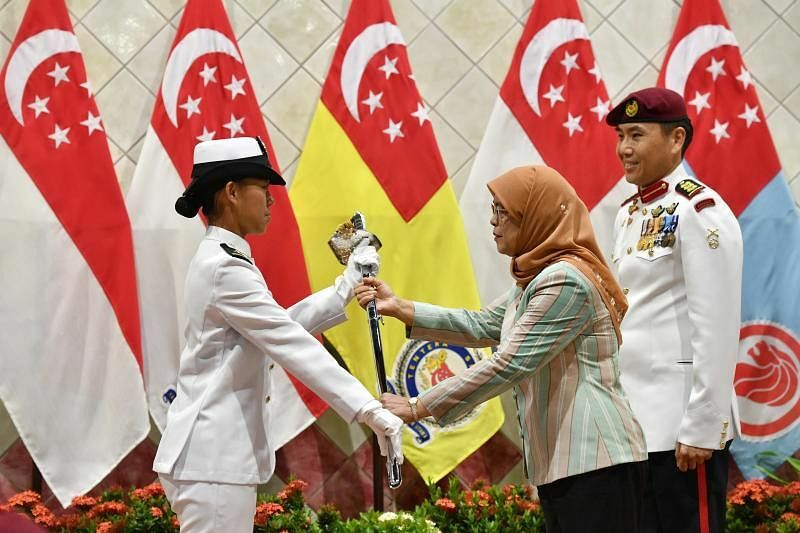 She also presented the sword of honour to eight recipients, including Second Lieutenant Audrey Tey Ee Teng, 19. 2LT Tey said: "The main reason why I signed on was because I want to contribute back to the country. I see meaning in the work the Navy does. Singapore is a maritime nation. Our survival is linked to the sea. I see real meaning in defending our waters." The ceremony, which was also attended by Defence Minister Ng Eng Hen, was all the sweeter because of the training the officers had undergone. 2LT Muhammad Haidi Bin Azaman, 19, said the nine-day Jungle Confidence Course in Brunei was gruelling, but taught him to push on with the right attitude to complete his tasks. "I hope that I can become a good Platoon Commander to not only inspire my men to strive to become good soldiers, but to also help them develop values that they can carry with them through their lives," he said. "What I want to do is to build a strong platoon so that we can contribute to the defence of Singapore."